Kenilworth celebrate clinching promotion. Picture by Willie Whitesmith. 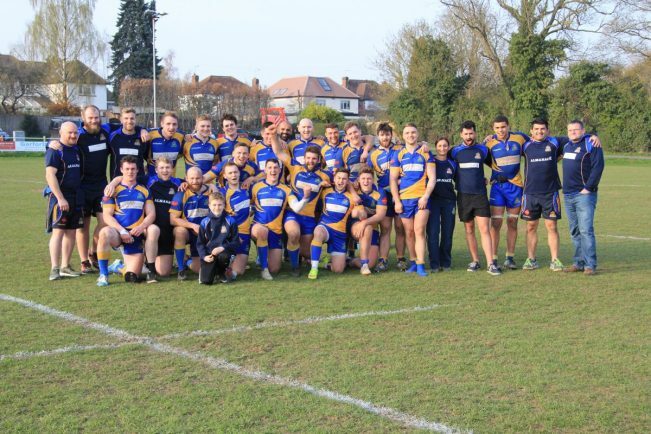 KENILWORTH RFC wrapped up the Midlands 2 West (South) title after victory over fourth-placed Nuneaton Old Edwardians. Their 39-19 win hands them the league crown with two games left to spare, in a game where they were backed by a vociferous home crowd at Glasshouse Lane. An early period of pressure brought the opening try from Gareth Renowden, converted by Ed Hannam for the added points, before the latter successfully kicked a penalty to put Kenilworth ten points in front. The try of the match scored by winger Tom Clayton was followed by Sam Harrison’s converted score, giving them a 22-0 lead heading into the break. Kenilworth’s dominance was epitomised by the efficiency in defence to cut out any opposition threat, whilst continuing to control the ball and pressure in Nuneaton territory. Hannam added a try which he then converted to add a bonus point for Kenilworth, before Clayton’s second of the match was backed up by a second also for Harrison. To the credit of Old Ed’s, they clambered back three tries towards the final ten minutes of the game with Kenilworth content with their lead – knowing that the title was moments away from being secured. Kenilworth can look forward to a trip to strugglers Old Coventrians on Saturday, before hosting second-placed Old Laurentians in the final game of the season the following weekend. The club are still in with a shout of further silverware, as they face South Shields Westoe on Easter Saturday (April 20) in the RFU Intermediate Cup semi-final, where the winners will step out on the Twickenham turf. Following that tie, the club face-off against rivals Earlsdon in the Warwickshire Shield final at the end of the month, with the venue still to be confirmed.